Crestron is changing the way lighting control systems are designed, specified, and installed with the new SpaceBuilder space-first, design-based solutions. LIGHTFAIR 2015 attendees will get an exclusive look at SpaceBuilder at Crestron booth # 830. Crestron will showcase SpaceBuilder design tools, product installations, and live commissioning demonstrations. With SpaceBuilder, lighting controls are designed on a space-first basis, reducing the complexity of building-first designs and saving time and money every step of the way. An online system filter helps even the novice designer to select the optimal Crestron system for their application. The accompanying automated configuration worksheets help to quickly complete the system design for a single space-type and can easily be copied for other similar spaces in the building. Designers no longer need to worry about knowing the product model numbers or technology specifications. All they need to know are the lighting requirements for the specific space. For years, lighting control design was perceived to be overly complicated to the extent that many specifiers were not comfortable doing their own lighting control design. This led to over-specification and over-design, which increased the cost of the entire project. SpaceBuilder eliminates this perceived complexity and simplifies the design by focusing on one space at a time. 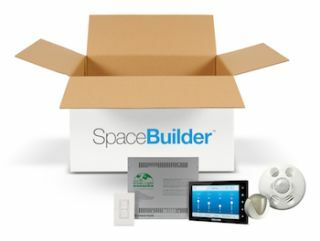 In addition to improving efficiencies for the design community, SpaceBuilder simplifies the delivery and installation process for the contractor. Rather than searching through pallets of dimmers, sensors, and keypads in a remote staging area, installers get one box for each room that contains all the components, technical information, and wiring diagrams needed to complete the installation. After installation, the contractor energizes the system and it immediately functions. Every Space Builder system arrives in its own box pre-programmed during production. It’s not necessary for a field tech or programmer to visit the site to program the system. SpaceBuilder enables commissioning and startup of an entire project in record time so the building can be occupied faster. When it’s time to start up an entire building, SpaceBuilder systems network together smoothly for master control, integrating with building management systems, or property management systems. Organizations can also monitor and manage AV equipment, room scheduling, lighting, shades, climate, and energy consumption from a single platform with Crestron Fusion enterprise management software. Visit Crestron at booth #830 at LIGHTFAIR International, May 5–7, 2014, at the Javits Center in New York, NY. To schedule a personal tour of the Crestron booth and to get an exclusive look at SpaceBuilder, email: clclighting@crestron.com. To get all the latest news, information and product updates subscribe to our blog, “Like” us on Facebook and follow us on Twitter.